Before going off into the great outdoors for a bout of deer hunting, you should carefully consider your gear. Whatever you’ve packed in your bag could prove essential to your survival, and success, of your deer hunting escapade. The clothes that you should bring along with you should serve 3 purposes: 1) comfort, 2) camouflage, 3) protection. These factors will guarantee a successful dear hunt, as well as your survival in the wild. Basic gear for a deer hunter is an all-weather jacket that protects you from the weather. It should be made from a thick and durable material that can withstand the harshest of environments. Whether it be summer or winter, your clothing should reflect the surrounding terrain since the less probability that the deer spots you increases your chance in landing the perfect shot. Various camouflaged jackets are designed to withstand the heat of summer and the freezing temperatures of winter, as well as the perfect coloring to blend in with the surroundings. You also need to make sure that your jacket contains enough pockets for various objects like ammunition, compass, scent wash, deer calls and rattles, since all these are essential to deer hunting. Your traditional sneakers and rubber shoes won’t provide the protection and durability to survive in the wild. Most seasoned hunters prefer to use rubber boots since they provide protection for wet terrains and enough durability to survive the rugged paths. It is also advisable that you bring an extra pair of shoes or boots when in the outdoors. As most experience deer hunters would quote, it is always a standing rule to be prepared for the unexpected. Extra footwear not only gives you a perfect spare when the first ones gets wet or damaged, but also a nice change when the insides start to smell. The Dream Season Boots from Robinson Outdoors is perfect for a deer hunting expedition. Aside from the feature that purges odor during trekking, it has a built-in shin guards which provide maximum support and protection. It also has a designed Climb Right Angle heel for superior traction when climbing trees for a strategic hunting. The durable construction, lightweight material and the reinforced toe makes these the perfect footwear for deer hunting. Bucks are flighty creatures at best and have a very sensitive sense of smell. Since its part of their defense mechanism for predators, this includes you, they can smell you for quite a distance giving them enough time to get out of range. The Dream Season Base Layer is a perfect undergarment to get rid of those smells caused by microorganism in your body. The undergarment features antimicrobials that kill bacteria upon contact thus eliminating the smell. When in the wild, weather is the most unpredictable force. A slight change in the weather can turn a sunny warm atmosphere into a cold wet afternoon. Packing extra clothing for any weather is your best bet in surviving the outdoor weather. When hunting in the wintertime, staying warm is a necessity especially when you lie and wait for your prey. Cabela’s Outfitter Fleece Windshear Pullover is the perfect outer garment if you need to stay warm. The windshear features protect you from the cold winds. 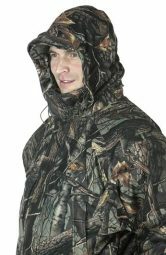 The hood and the perspiration vapor escape is perfect in trapping the heat inside and letting the frigid air out! Bring the right clothes and gear before deer hunting not only gives you the edge you need for a successful hunt, but also the comfort and protection that only these gears can provide.